Every year, the immigration issue gets worse and this year is no exception. Migrants are dreaming of the English Eldorado and as a result, they flock to Calais in order to attempt to cross the Channel in whatever way possible. The port has become the main transit point for these foreigners, who want to reach England. They were 250 in June, they are more than 1500 three months later, and the city can no longer cope with this influx; last August, the clashes between migrant groups multiplied, causing about fifty casualties. 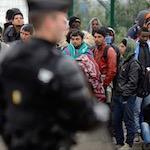 Consequently, the French Home Affairs minister has given the green light to build a day centre for migrants. Fifteen years after the opening of Sangatte centre - closed in 2002 by Nicolas Sarkozy - the circle is complete; the result of a migration policy torn between humanitarian concerns and incapacity to counter the migrant influx. To curb illegal immigration, Natacha Bouchard has asked for London’s financial backing in securing the port. The mayor of Calais has even threatened to close it if the UK authorities do not help resolve the issue. Important questions still remain however, over the manner in which the problem is to be solved as well as the porosity of the EU and whether or not it should help in resolving the issue.